Are you an electrical engineer searching for a job now? Thinking of what to do next? Have you ever thought about what jobs you can do after your graduation? If you have these questions in your mind, then this article is for you. Keep reading. 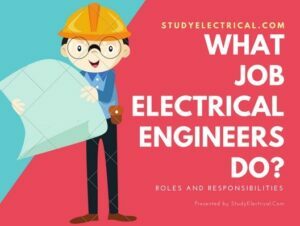 In this article I will list some of the common job roles and responsibilities handled by electrical engineers all over the world. After going through this article you will get a clear idea about the various roles handled by electrical engineers in the industry. Also read how to become an electrical engineer. Any electrical or technical organization is made up of a group of individuals with various duties. All working together for their own good, the good of their employer and their customers. Here is the list of some of those common jobs an electrical engineer can do. There is often no clear distinction between the duties of the individual employees, each do some of the others work activities. Responsibilities vary, even by people holding the same job title and some individuals hold more than one job title. However, let us look at some of the roles and responsibilities of those electrical engineers working in the electrotechnical industry. The design engineer will normally meet with clients and other trade professionals to interpret the customer’s requirements. He or she will produce the design specification which enables the cost of the project to be estimated. This person measures the quantities of labor and material necessary to complete the electrical project using the plans and specifications for the project. From these calculations and the company’s fixed costs, a project cost can be agreed. A contract manager will monitor progress in consultation with the project manager on behalf of the electrical companies. They cost out variations to the initial contract. Project manager is responsible for the day-to-day management of one specific contract. He/She will have overall responsibility on that site for the whole electrical installation. Project manager attends site meetings with other trades as the representative of the electrical contractor. He/She checks that the contract targets are being met. All Service managers checks that the customer is satisfied with all aspects of the project. The Service Manager’s focus is customer specific while the Project Manager’s focus is job specific. He maintain records such as ISO 9000 quality systems. be the leader of a small team (e.g. electrician and trainee) installing electrical systems. will have, or be working towards, a recognized electrical qualification and status as an electrician, approved electrician or electrical technician. Maintenance Engineer is responsible for keeping the installed electrical plant and equipment working efficiently. This engineer might be responsible for a hospital or a commercial building, a university or college complex. When faults or breakdowns do occur he or she will be responsible for the repair using the company’s maintenance staff. I am a fresher to electrical engineering. Your articles was easy to understand and effective. Please continue updating the contents and I will be supporting you. Wish you all the best for your future career.